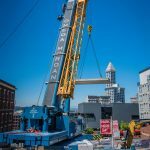 Moving construction equipment is what we do. 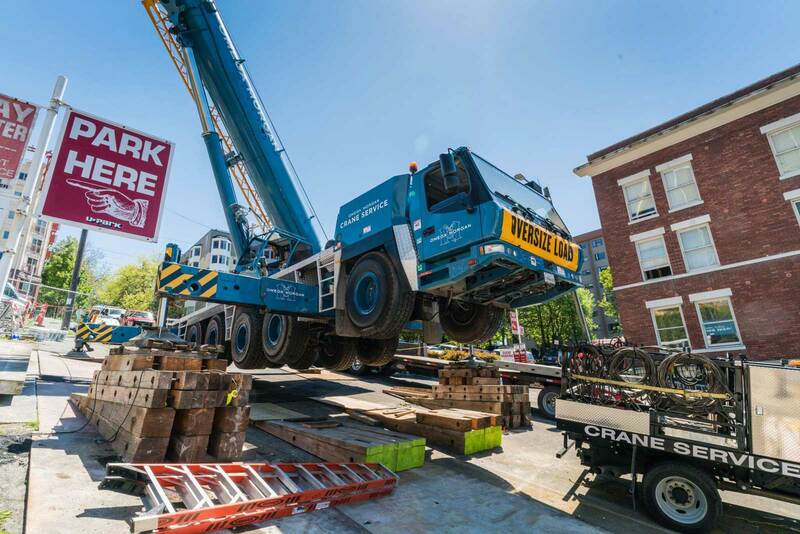 But at the time, this Seattle crane services project was one that seemed to be a challenge for a brand new division. 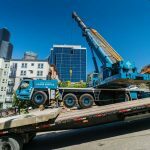 A client in Seattle needed to both move and set a (6) section vault. It seemed like a perfect opportunity to leverage our joint venture with Sarens. The resulting equipment seemed like a perfect marriage with our existing expertise to achieve customer satisfaction. This type of job tends to bring both challenges and opportunities. The confined downtown space at a steep pitch meant we had to use just the right strategy and equipment. 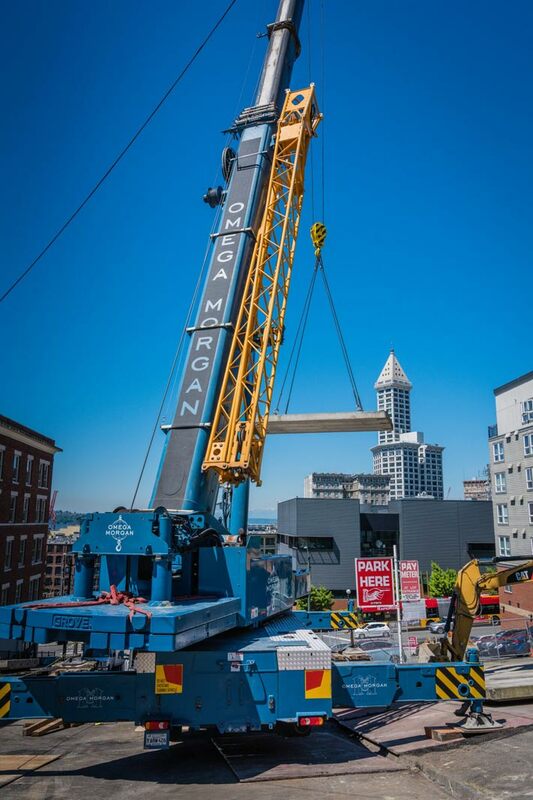 A successful project would show the world that Omega Morgan is a force to be reckoned with in the crane services space, even for difficult jobs. 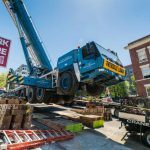 Moving construction materials in downtown Seattle is difficult enough. Traffic and confined areas can lead to limited mobility for heavy equipment like the GMK 5220. Having to move those materials on an 18% grade only adds to that difficulty. Keeping the equipment level became as crucial as operating the crane to get the vault safely in place. The individual picks carried some significant weight. The heaviest was right around 42,000 pounds, enough to crush both equipment and property underneath should something go wrong. 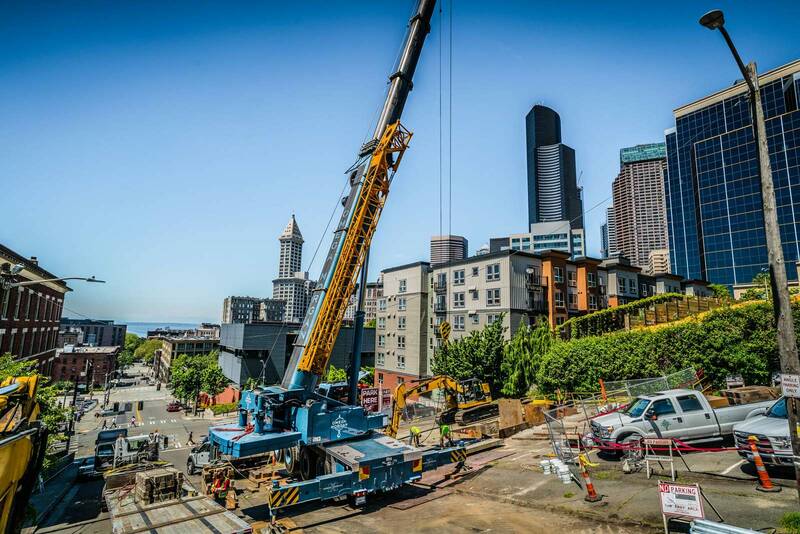 It seemed like the perfect challenge to showcase how newly gained abilities in crane operations have further enhanced our expertise in moving construction equipment with this Seattle crane services project. 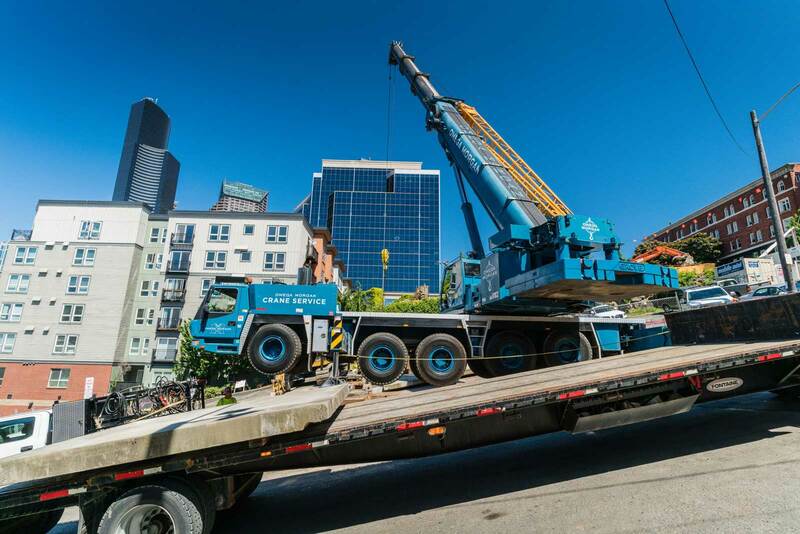 Our first choice for this Seattle crane services project was to bring out the GMK 5220 all terrain crane. This crane is known throughout the industry for its power and reliability, especially for heavy weights in tight situations. It seemed like the perfect equipment to finish the job. Importantly, it’s also fast enough to keep the operations contained to the customer’s desired timeline. The next consideration was the 18% grade. Here, we first had to block off the street to keep civilians safe and allow for the necessary room to operate. We then set up our crane mats, which are an extremely crucial part of the job. They helped us safely hook into and fly the pieces to their destination, staying level even on a steep pitch. In the process, we fully leveraged the GMK 5220’s 20-foot picking radius. Thanks to a strategic and thought-out setup, we were able to move all six pieces and set them as required. Our job was done within the desired time frame, which allowed construction to proceed as planned. Not a small task, considering the heaviest piece weighed 21 tons. Our task of picking and setting 6 vault pieces was successful and smooth. For our customer, it was an important part of the process to finish construction. For us, it was proof that the Sarens joint venture had started to pay off. This was one of our very first crane picking jobs. The ease with which we accomplished the task exemplifies just what we gained in partnering with an equipment provider like Sarens. Our professionalism and experience in moving construction equipment left a lasting impression on the customer. 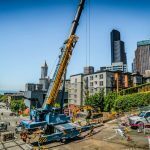 It positions us ideally for any future Seattle crane services projects specifically or regionally within the construction industry.